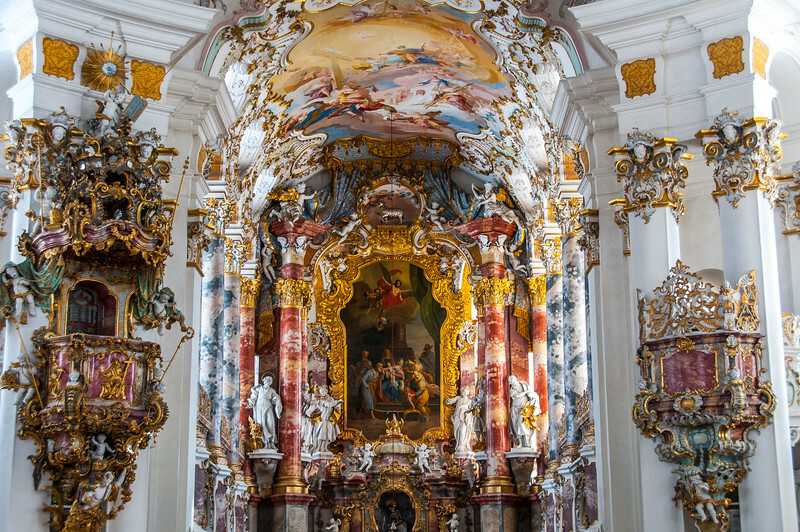 The sanctuary of Wies, a pilgrimage church miraculously preserved in the beautiful setting of an Alpine valley, is a perfect masterpiece of Rococo art and a masterpiece of creative genius, as well as an exceptional testimony to a civilization that has disappeared. The hamlet of Wies, near Steingaden in Bavaria, was the setting of a miracle in 1738: a simple wooden image of Christ mounted on a column, which was no longer venerated by the Premonstratensians, appeared to some of the faithful to be in tears. A wooden chapel constructed in the fields housed the miraculous statue for some time. However, pilgrims from Germany, Austria, Bohemia, and even Italy became so numerous that the Abbot of the Premonstratensians of Steingaden decided to construct a splendid sanctuary. Accordingly, work began in 1745 under the direction of the celebrated architect, Dominikus Zimmermann, who was to construct in this pastoral setting in the foothills of the Alps one of the most polished creations of Bavarian Rococo. The choir was consecrated in 1749 and the remainder of the church finished by 1754. That year Dominikus Zimmermann left the city of Landsberg where he lived to settle in Wies near his masterpiece, in a new house where he died in 1766. The Pilgrimage Church of Wies (aka Wieskirche in German) is a small church located in the village of Wies outside of Steingaden. From the outside, the church is not impressive. It is just a normal country church like you could see in any village. Inside, it is like someone detonated a Baroque bomb. Color, ornaments, and stylings cover every wall and ceiling. The church is one of the smallest world heritage sites I have visited. Perhaps second only to the Rietveld Schröder House in the Netherlands. It will probably only take you 15-30 minutes to explore the church. Once you are inside and can see the artwork, that’s all there is. During my short time at the church, there were two buses of tourists which came through. Wies is only a 15-20 minute drive from the popular destination of Neuschwanstein Castle. If you are going to visit Neuschwanstein it is worth it to take a few more minutes to visit Weis. The Pilgrimage Church of Wies is a cultural UNESCO World Heritage Site in Germany. It was inscribed in 1983 as a religious structure linked to the Christian faith. 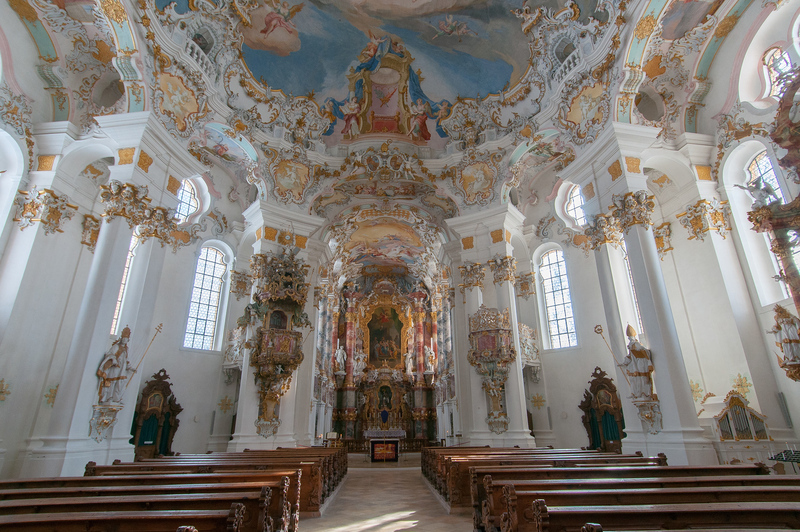 Aside from being a pilgrimage church, it is also recognized by UNESCO as the best example of the Bavarian Rococo architectural style. The church was built in 1745 and completed in 1754. It features exuberant stucco work and frescoes that are made with lively and vibrant colors. This church was built through the initiative of brothers Dominikus Zimmermann and Johann Baptist. The Pilgrimage Church of Wies stands out in the Bavarian countryside in Wies located right in the middle of green rolling fields. The remote location of this church is for a reason though. It is not designed for everyday parishioners. Instead, it was built as a site of pilgrimage for the Christian worshippers. Since there will be a large number of pilgrims visiting the church, it needed to be big enough to accommodate all of them. Hence, the design of the church was meant to be impressive in size, but also in terms of its aesthetics. The interior details reflect the lofty ideals for the church by the time of its construction. From the outside, the Pilgrimage Church of Wies features soft and rounded edges with a sense of tranquility. The inside is where the pilgrims will be quite impressed – it is filled with colors and intricate details. 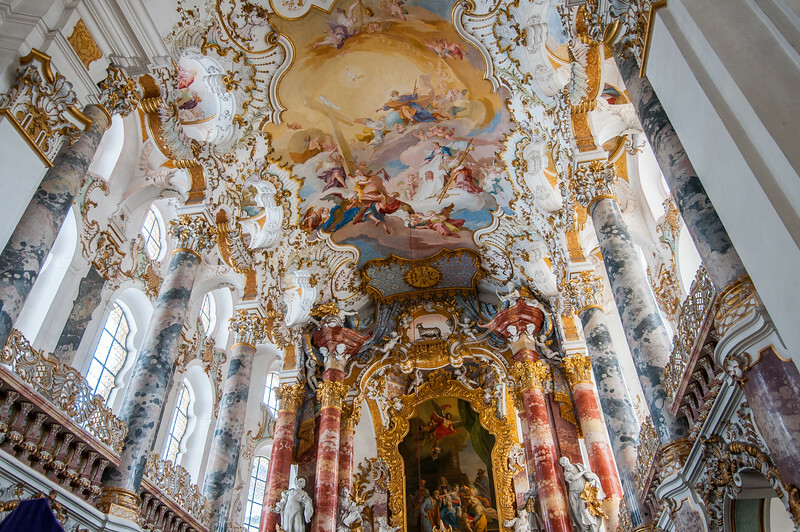 In fact, the interior details of the church are considered as Germany’s best example of rococo architecture. The main section of the building consists of statues, painted ceilings, complex plasterwork, and golden trims. You will notice that the colors and details become more intense around the altar area. 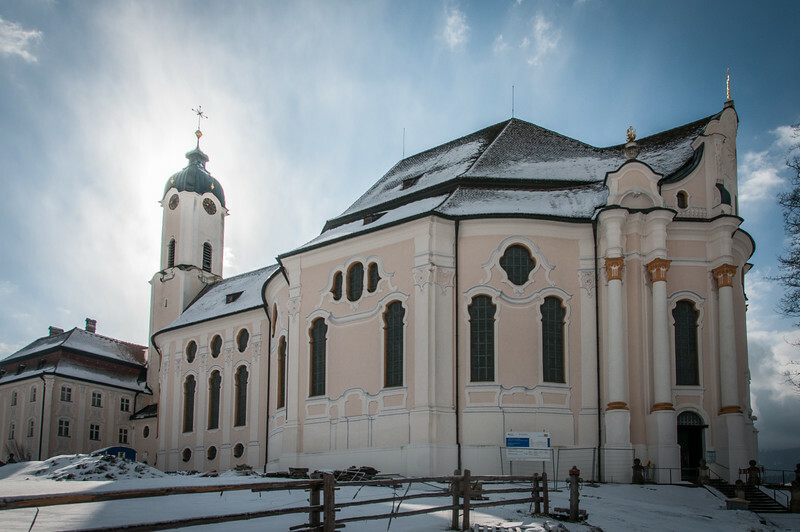 During the 18th century, the Pilgrimage Church of Wies is one of Europe’s most important pilgrimage sites. The miracle stories for those who came to this church and prayed on Jesus’ wooden statue started to become widespread. Hence, this prompted more pilgrims to come to this church. The interior design of the Pilgrimage Church of Wies is more than just about the work of architecture. It is also believed to be an intentional design that is meant to reflect the spirituality of the pilgrimage. In fact, the fresco at the church’s main ceiling depicts the resurrected Christ along with the door to eternal life. It is therefore hinged on the theological belief that redemption can be achieved through sacrifice. 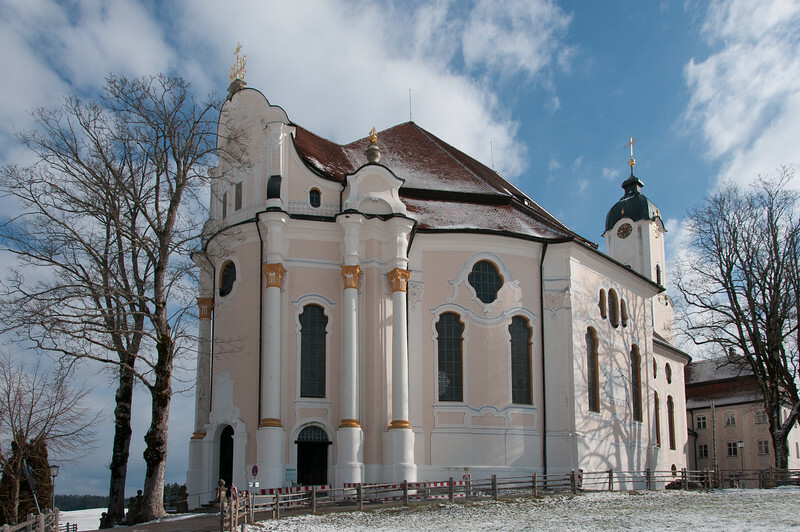 If you want to visit the Pilgrimage Church of Wies, the nearest tourist town is Fussen. Hence, this is a good starting point for pilgrims or tourists who want to visit the church. You will also find a few other tourist attractions within the area and that includes one of the world’s most famous castle, the Neuschwanstein Castle. Many tourists who come here visit the Pilgrimage Church of Wies as part of a day trip to give them a chance to explore other attractions nearby. The church itself is small; hence, it takes only a few minutes to look around and explore. My family is from this area, (Bodensee) and we went to visit this church on our way to visit my cousin in Munich. It’s so quaint and beautiful. Love the photos!